Department of Geology, The University of Vermont, Burlington, VT 05405, U.S.A. The tourmaline atomic arrangement is one of the last rock-forming silicate structures to be investigated in detail. Although putatively possessing hexagonal R3m symmetry, reports of optically-anomalous tourmaline are common, and recently an occurrence of triclinic tourmaline was reported with dissymetrization resulting from non-equivalency of the occupants of the tourmaline Y-sites. We here report the atomic arrangement of a Ni-bearing tourmaline from the Middle Urals, Russia, in non-conventional triclinic space group R1 (R = 4.41%) to facilitate comparison with the conventional R3m cell. The dissymetrization occurs as a result of inequalities of the hexagonal Y and Z tourmaline sites, in contrast to the single previous structure study. The atomic arrangement demonstrates that the tourmaline atomic arrangement is robust, and is capable of incorporating various substituents by modifying the putative structure in lower symmetries, suggesting that further exploration of tourmaline’s role in trace-element variation is warranted. Optical studies demonstrate a 2V greater than zero. 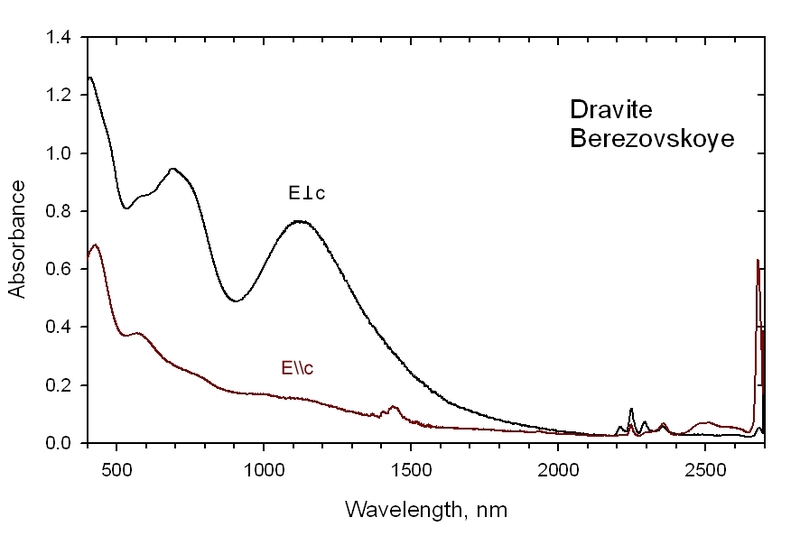 Spectroscopic studies show the optical absorption spectrum of the Ni-tourmaline has strong absorptions in the 400, 600-700, and 1100 nm regions, in addition to OH features near 1450, 2300, and 2700 nm. 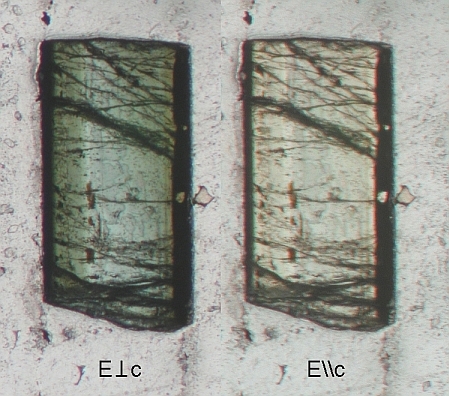 It is concluded that the color in the E perpendicular to c polarization comes dominantly from Fe mixed-oxidation-state couples, and from Cr3+. Contributions from the nickel are believed to be minor and will fall in the regions of strong Cr and Fe absorption.